The Liangzhu culture (c. 3400-2250 BC) is one of the late Neolithic cultures of the Lake Tai region which extended over Jiangsu and Zhejiang provinces. 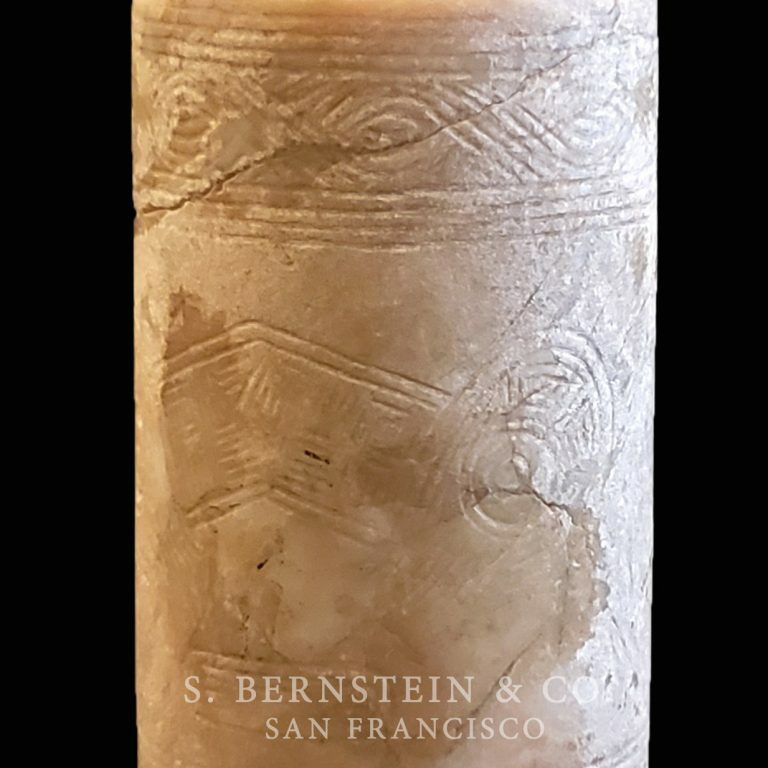 Recent archaeological excavations have provided valuable insight into this culture, its arts, and ritual activity. The Liangzhu was a prosperous, patriarchal, agrarian culture which used jade objects as ornamentation, symbols of wealth and status, and in ritual ceremony and burial. This bead is characteristically round in shape. A biconical hole, bored from both ends, runs the interior length of the bead with a slight offset at the center. The surface of the bead has been polished which indicates that the bead may have been part of a larger pectoral necklace. 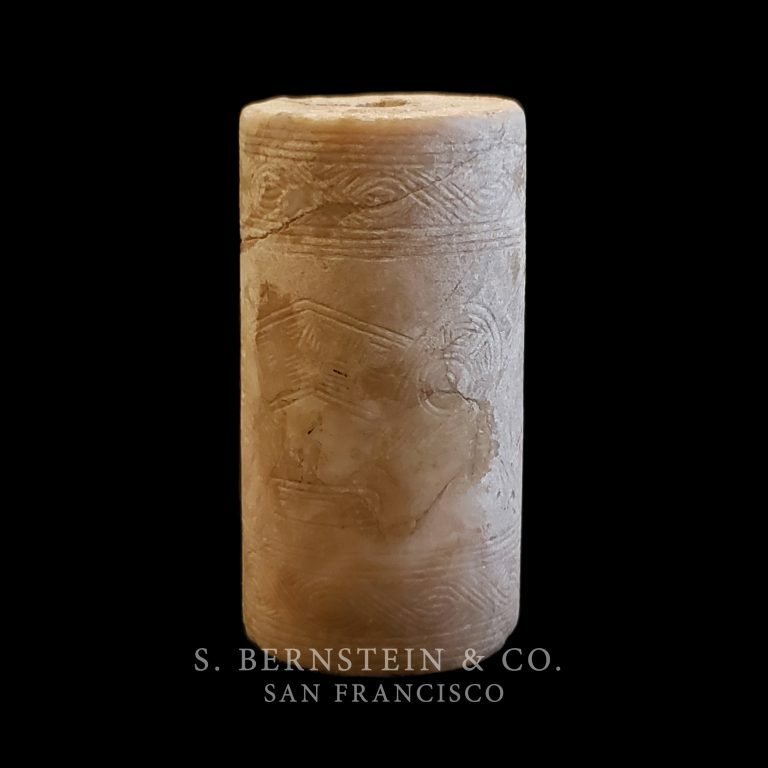 The surface shows extensive affectation from prolonged burial, seen in the slight luminescence and overall white coloration of the jade material. Other surface areas show evidence of being burnt, most likely in conjunction with a ritual ceremony. It is thought that fire was considered a Liangzhu deity. This speculation might suggest that the ritual of burning objects was linked to the worship of heaven, earth, and ancestors. Most other examples of beads excavated from Liangzhu culture sites are tubular and of uniform diameter. Many tubular beads of this culture are derived from the form of the Liangzhu cong, a prevalent ritual implement found in many sites. Wider at the top, this form tapers in subtly towards the base. Because of a more advanced jade working technique to produce this more refined form, the subtle flaring of this bead indicates a higher level of artistry and workmanship than that of the tubular bead. Masks, believed to represent Liangzhu deities are incised along the surface of the bead. As seen in other excavated examples of Liangzhu ritual objects, masks appear in groups of two, one mask on top of the other. Another characteristic which distinguishes this piece as Liangzhu in origin is the superb polish. Liangzhu ritual objects share this quality of careful finishing and preservation, for the pieces were made expressly for ritual and placed with their eminent owner. Based on archaeological evidence, the Liangzhu culture is the first to assert a hierarchical system based on classes. Objects fashioned of jade were viewed as signs of prestige and were uniquely destined to the social elites of Liangzhu culture. In our opinion, the refined shape, polish, and decoration make this a fine example of a Liangzhu ritual ornament. For a comprehensive discussion on Liangzhu culture see Gems of Liangzhu culture. Huang Xuanpei et al. Hong Kong: Shanghai Museum and Urban Council, 1992. Pages 27-33. A detailed report on the development and discovery of Liangzhu jades is published in “The Liangzhu Culture: It Discovery and Its Jades.” Sun Zhixin. Early China 1993.18. Pages 4-40. For a discussion of Liangzhu jades, see “Dragons, Masks, Axes and Blades from four Newly-documented Jade-producing Cultures of Ancient China.” Elizabeth Childs-Johnson. Orientations. April, 1988. Pages 37-39. For an illustration of the evolution of mask representations in Liangzhu art, see Gems of Liangzhu Culture from the Shanghai Museum. Huang Xuanpei et al. Hong Kong: Shanghai Museum and Urban Council, 1992. Page 25. The high degree of polish of this bead as well as its coloration are similar to other Liangzhu examples, notably two in Gems of Liangzhu Culture from the Shanghai Museum. Huang Xuanpei et al. Hong Kong: Shanghai Museum and Urban Council, 1992. Page 74, plate 64 and page 184, plate 69. Similar Liangzhu tubular ornaments are illustrated in Zhongguo meishu fenlei quanji: Zhongguo yuqi quanji 1, yuanshi shehui [Chinese Arts Series: Chinese Jade, Volume 1, Primitive Societies] Mou Yongkang, ed. Shijiazhuang: Hebei Art Publishing, 1992. Pages 158-60, plates 222-226. Note how plates 223, 226 are close in form to Liangzhu cong. Two Liangzhu cylindrical beads, of uniform widths, are illustrated in Chinese Archaic Jades from the Kwan Collection. Yang Boda. Hong Kong: Chinese University, 1994. Plate 47. The size of this bead is related to the prestige of its designated owner. For more information on the mensuration stipulations of Neolithic cultures, see “A Measure of Man in Early China: In Search of the Neolithic Inch.” David Keightley. Prepared for the Symposium, “Chinese ‘Identities'” Center for Chinese Studies, University of California, Berkeley, 25-26 February, 1994.